COMMENTS:        This trigger occurred at longitude,latitude = 227.65,-8.98 [deg]. COMMENTS:        The XRT position is 1.25 arcmin from the BAT position. COMMENTS:        The UVOT position is 1.4 arcsec from the XRT position. Dec(J2000) = +25d 22' 41"
with an uncertainty of 3 arcmin (radius, 90% containment, including systematic uncertainty). The BAT light curve showed a single-peaked structure with a duration of about 10 sec. The peak count rate was ~1500 counts/sec (15-350 keV), at ~3 sec after the trigger. Dec(J2000) = +25d 22' 25.6"
with an uncertainty of 4.8 arcseconds (radius, 90% containment). This location is 72 arcseconds from the BAT onboard position, within the BAT error circle. This position may be improved as more data are received; the latest position is available at http://www.swift.ac.uk/sper. We cannot determine whether the source is fading at the present time. No spectrum from the promptly downlinked event data is yet available to determine the column density. The initial flux in the 2.5 s image was 3.58e-09 erg cm^-2 s^-1 (0.2-10 keV). with a 90%-confidence error radius of about 0.75 arc sec. This position is 1.4 arc sec. from the center of the XRT error circle. The estimated magnitude is 17.07 with a 1-sigma error of about 0.14. No correction has been made for the expected extinction corresponding to E(B-V) of 0.03. Dec (J2000): +25d 22' 27.0"
We observed the field of GRB 170519A (Ukwatta et al., GCN 21106) with the T24 (Plane Wave CDK 0.61m) of the iTelescope.Net (http://www.itelescope.net) located at Auberry, CA. A single image of 300 s was taken in the V filter, starting at 07:18:04 UT, 2.13 hr after the GRB trigger. The GRB optical afterglow is clearly detected with a preliminary photometry estimate of V ~ 18, as compared to field stars of the GSC2.3 catalog. We observed the field of GRB 170519A (Ukwatta, et al., GCN 21106) with the Reionization and Transients Infrared Camera (RATIR; www.ratir.org) on the 1.5m Harold Johnson Telescope at the Observatorio Astron=F3mico Nacional on Sierra San Pedro M=E1rtir from 2017/05 19.22 to 2017/05 19.32 UTC (1.8 minutes to 2.44 hours after the BAT trigger), obtaining a total of 1.41 hours exposure in the r and i bands and 0.60 hours exposure in the Z, Y, J, and H bands. These magnitudes are in the AB system and are not corrected for Galactic extinction in the direction of the GRB. The lightcurve rises in all bands initially, peaking at i~16 at about 15 minutes after the GRB trigger, then fading as t^(-0.8). 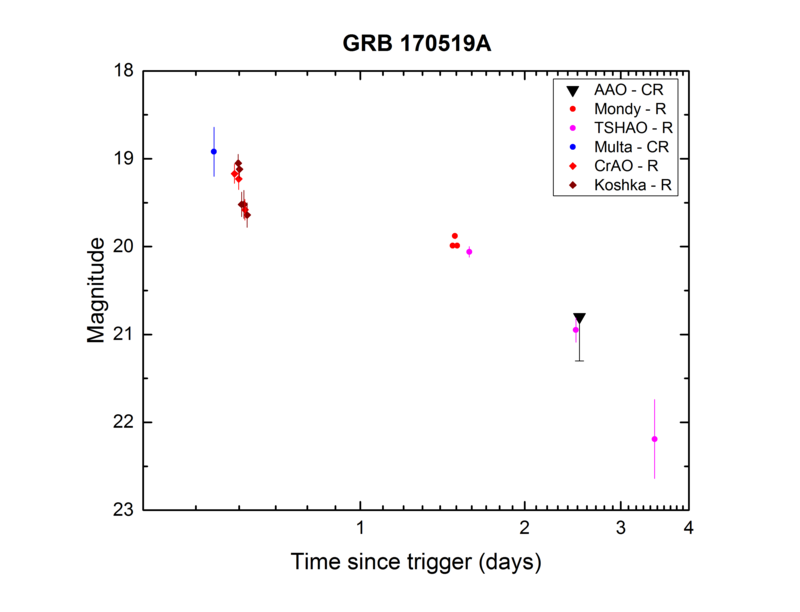 We observed the field of GRB 170519A (Ukwatta et al., GCN 21106) using the 1-m telescope located at Weihai, Shandong, China. We obtained 4x360s frames in the Sloan r-filter, starting at 11:52:54 UT on 2017-05-19, i.e., 6.71 hr after the burst. The optical afterglow (Ukwatta et al., GCN 21106; Izzo et al., GCN 21108) is clearly detected in our stacked image, and it has decayed to m(r) = 18.92 +/- 0.06 at 6.94 hr post-burst, calibrated with nearby SDSS stars. Dec(J2000) = +25d 22' 26.6"
with an uncertainty of 1.5 arcmin, (radius, sys+stat, 90% containment). The partial coding was 100%. The mask-weighted light curve shows an initial peak starting around T-30 s, peaking at T+0 s, and decaying by T+15 s. Then there is a second, weaker peak from about T+180 s to T+220 s. T90 (15-350 keV) is 216.4 +- 49.4 sec (estimated error including systematics). The time-averaged spectrum from T-28.5 to T+255.6 sec is best fit by a simple power-law model. The power law index of the time-averaged spectrum is 1.94 +- 0.26. The fluence in the 15-150 keV band is 1.1 +- 0.2 x 10^-6 erg/cm2. The 1-sec peak photon flux measured from T+0.84 sec in the 15-150 keV band is 0.7 +- 0.1 ph/cm2/sec. All the quoted errors are at the 90% confidence level. We have detected GRB 170519A optical afterglow at iTelescope observatory T11 (Mayhill, New Mexico) using 0.51-m/6.8 Planewave CDK telescope and FLI ProLine PL11002M CCD camera. The observations were started at 2017-05-19 05:25:24 (UT). Eleven unfiltered images and seven photometric R filter images with 120 sec exposure time were taken. The optical afterglow was detected at the position RA 10:53:42.46 and DEC +25:22:27.4. Tmid(s)+T0    Filter          Exp. time     Mag                 Mag err. We have analysed 9.5 ks of XRT data for GRB 170519A (Ukwatta et al. GCN Circ. 21106), from 73 s to 23.1 ks after the BAT trigger. The data comprise 291 s in Windowed Timing (WT) mode (the first 6 s were taken while Swift was slewing) with the remainder in Photon Counting (PC) mode. The enhanced XRT position for this burst was given by Beardmore et al. (GCN Circ. 21107). The late-time light curve (from T0+4.1 ks) can be modelled with a power-law decay with a decay index of alpha=0.94 (+/-0.08). A spectrum formed from the WT mode data can be fitted with an absorbed power-law with a photon spectral index	of 2.62 (+/-0.05). The best-fitting absorption column is 1.78 (+0.12, -0.11) x 10^21 cm^-2, in excess of the Galactic value of 2.4 x 10^20 cm^-2 (Willingale et al. 2013). The PC mode spectrum has a photon index of 1.98 (+/-0.10) and a best-fitting absorption column of 1.20 (+0.29, -0.27) x 10^21 cm^-2. The counts to observed (unabsorbed) 0.3-10 keV flux conversion factor deduced from this spectrum is 3.4 x 10^-11 (4.3 x 10^-11) erg cm^-2 count^-1. If the light curve continues to decay with a power-law decay index of 0.94, the count rate at T+24 hours will be 0.030 count s^-1, corresponding to an observed (unabsorbed) 0.3-10 keV flux of 1.0 x 10^-12 (1.3 x 10^-12) erg cm^-2 s^-1. The results of the XRT-team automatic analysis are available at http://www.swift.ac.uk/xrt_products/00753445. The 60 cm BOOTES-5/Javier Gorosabel Telescope at Observatorio=20 Astron=F3mico Nacional in San Pedro M=E1rtir (M=E9xico) automatically=20 responded to the Swift trigger of GRB 170519A (Ukwatta et al., GCN=20 21106). The first unfiltered images (60 s exposures) were obtained at=20 05:15:08.9 UT (5 min after the burst). At the position of the Swift=20 X-ray afterglow, we confirm the optical afterglow detected by UVOT, at a=20 magnitude of 16.6+/-0.1 when compared to the GSC2.3 catalog, and fading=20 during the late-time BOOTES-5/JGT observation. We thank the staff at Observatorio Astron=F3mico Nacional in San Pedro=20 M=E1rtir for its excellent support. The Swift/UVOT began settled observations of the field of GRB 170519A 93 s after the BAT trigger (Ukwatta et al., GCN Circ. 21106). A fading source consistent with the XRT position (Beardmore et al. GCN Circ. 21107) is detected in all initial UVOT exposures. We observed the afterglow of the GRB 170519A (Ukwatta et al., GCN 21106) using OSIRIS on the 10.4m GTC at the Roque de los Muchachos observatory (La Palma, Spain). The observation consisted of 3x1200s exposures using the R1000B grism, covering the range between 3700 and 7800 AA. The first spectrum started at 21:23 UT (16.22 hr after the burst). We detect clear absorption features due to Mg II, Mg I, Fe II, Fe II* and Ca II H&K lines at the common redshift of z = 0.818, which we identify as the redshift of the GRB. We have observed the field of GRB 170519A (Ukwatta et al., GCN 21106) with the 2.5m Nordic Optical Telescope at La Palma (Spain). The observations consisted of 3x120s in V-band and 5x120s in Sloan i-band. The GRB afterglow is well detected in all the individual frames. On an image starting at 21:51 UT (16.68 hr after the burst) we detect the optical afterglow at i(AB) = 19.7 mag, as compared to SDSS field stars. This confirms the t^(-0.8) decay reported by Butler et al. (GCN 21109) and by Zheng et al. (GCN 21115) that started 900 s after the GRB trigger. We observed the field of GRB 170519A (Ukwatta et al., GCNC 21106) with the optical three color (g', Rc and Ic) CCD camera attached to the MITSuME 50cm telescope of Okayama Astrophysical Observatory. The observation started on 2017-05-19 11:03:26 UT (~5.9 h after the burst). We detected the previously reported afterglow (Ukwatta et al., GCNC 21106; Izzo et al., GCNC 21108) in all the three bands. Photometric results of the OT are listed below. We used SDSS-DR8 catalog for flux calibration. We observed the field of GRB 170519A (Ukwatta,, et al., GCN 21106) with the Reionization and Transients Infrared Camera (RATIR; www.ratir.org) on the 1.5m Harold Johnson Telescope at the Observatorio Astron=F3mico Nacional on Sierra San Pedro M=E1rtir from 2017/05 20.16 to 2017/05 20.32 UTC (22.66 to 26.62 hours after the BAT trigger), obtaining a total of 2.49 hours exposure in the r and i bands and 0.97 hours exposure in the Z, Y, J, and H bands. We thank the staff of the Observatorio Astron=F3mico Nacional in San Pedro Martir. We observed the field of GRB 170519A (Ukwatta, et al., GCN 21106 using th= e 40cm UCD Watcher telescope at Boyden Observatory in South Africa. Observations started on May 19th at 16:30 UT (T0+11.5h) and consisted of = a series of 20s exposures in SDSS r=E2=80=99 filter for a total monitorin= g time of 3 hours. Based on combined images with mid-time at 17:00 UT, we= derive a preliminary magnitude of r=E2=80=99=3D19.3 +/- 0.3 (AB system). Magnitudes were calibrated using 2 nearby APASS stars. No correction for = Galactic extinction in the direction of the GRB has been applied. We searched for the optical counterpart of GRB 170519A (T. N. Ukwatta et al =2E, GCN Circular #21106) with the optical three color (g', Rc, and Ic) CCD cameras attached to the MITSuME 50 cm telescope of Akeno Observatory, Yamanashi, Japan. The observation started on 2017-05-19 11:03:14 UT (21192 sec after the burst). We detected the optical counterpart (T. N. Ukwatta et al., GCN Circular #21106) in g', Rc and Ic band. The measured magnitudes were listed as follows. We observed the field of GRB 170519A (Ukwatta et al., GCN 21106) with 22cm SSS-220 telescope of ISON/Multa observatory(* starting on May 19 (UT) 16:02:54. We took 120 unfiltered frames with 60 s exposure. The optical transient (Ukwatta et al., GCN 21106; Izzo, et al., GCN 21108) is clearly detected in a combined image. *) The ISON/Multa observatory is located in Altai, N 50d 10h 07m E 85d 57' 25". The SSS-220 telescope (22 cm, f/2.3) is equipped with CCD camera ML 11002. 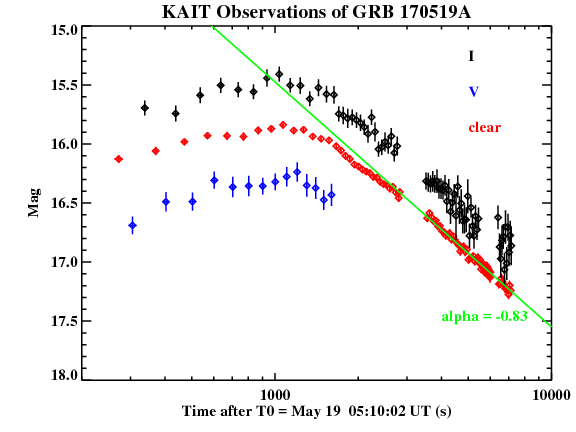 We observed the field of the GRB 170519A (Ukwatta et al., GCN 21106) with AZT-11 telescope of CrAO observatory starting on May 19 (UT) 19:07:44, and with Zeiss-1000/Koshka telescope of Simeiz branch of CrAO observatory starting on May 19 (UT) 19:28:57. We took several images in filter R with exposures of 180 s. We clearly detect the afterglow (Ukwatta et al., GCN 21106; Izzo et al., GCN 21108) in combined images. We observed the field of GRB 170519A (Ukwatta et al., GCN 21106) with AZT-33IK telescope of Sayan observatory (Mondy) starting on May 20 (UT) 16:27:01. We took several images in R-filter with exposures of 120 s. The optical afterglow (Ukwatta et al., GCN 21106; Izzo, et al., GCN 21108) is clearly visible in single images. We continued our observations on May 27 (UT) 16:28:02, i.e., ~8.5 days after the BAT trigger. We took several R-filtered images. We do not detect the optical counterpart in the enhanced XRT error circle (Beardmore et al., GCN 21107). The photometry is based on nearby SDSS stars reported by Mazaeva et al. (GCN 21169). We observed the field of GRB 170519A (Ukwatta et al., GCN 21106) with Zeiss-1000 1-m telescope of Tien Shan Astronomical Observatory starting on May 20 (UT) 18:42:38. We took several images in R-filter with exposures of 120 s during this night and 2 subsequent nights. The optical afterglow (Ukwatta et al., GCN 21106; Izzo, et al., GCN 21108) is visible in stacked images. We also observed this field with AS-32 (0.7m) telescope of Abastumani Observatory on May 21 (UT) 17:22:33. We took several unfiltered frames with 60 s exposure. In the enhanced XRT error circle (Beardmore et al., GCN 21107) we do not detect the afterglow. The photometry is based on nearby SDSS stars, reported by Mazaeva et al. (GCN 21169). The AMI Large Array robotically triggered on the Swift alert for GRB 170519A (Ukwatta et al., GCN 21106) as part of the 4pisky program, and subsequent follow up observations were obtained up to 10 days post-burst. Our observations at 15 GHz on 2016 May 19.61, May 20.84, May 23.74 and May 27.78 (UT) do not reveal any radio source at the XRT location (Beardmore et al., GCN 21107), with 3sigma upper limits of 228 uJy, 190 uJy, 150 uJy, and 100 uJy respectively.